Any time my kids can get their hands dirty and make something, they consider it a good day! Adding an artistic element to any subject certainly enhances the learning and enjoyment. When you find a product that is versatile enough to be used with whatever topic you're learning about, you make note of it. Today I get to tell you about Rigid Wrap and CelluClay Quik-Sculpting Kit from ACTÍVA Products and a couple of the things we made from the ACTÍVA Products' Favorite Sculpture KIDS CRAFTS ebook. (2) 4 in. x 5 yard Rolls of Rigid Wrap. Rigid Wrap is a plaster coated gauze that provides an even texture for sculpture, jewelry, mask making and all kinds of craft projects. To use you cut it into strips, prepare a container of water, dip strips into the water and lay onto the base or object you are working with. Once it dries you are ready to paint. After looking through the Kids Crafts ebook (it is available to download for free from their website), we decided to try making a Dinosaur, but the template also had an Egyptian Sarcophagus on the same page so we used both and made two templates of each. The ebook contains 12 different projects in all and I felt they set the stage for how I might go about making much anything else. The CelluClay felt like playing with oatmeal! Both of my children made one with CelluClay and one with Rigid Wrap. The most challenging part of the whole project was waiting for them to dry! We let them dry over night, but when they still weren't completely dry, we set them out in the blazing Oklahoma heat for a little while and they were ready to go. After painting the CelluClay, my son really wanted to use markers on the Rigid Wrap one. And so they did! We found that the Rigid Wrap dried a lot faster than the CelluClay and seemed sturdier all around, but the CelluClay gives shape and size a lot easier than the Rigid Wrap. One thing we didn't try was using the two together. Together I expect they would create a dense, but smooth texture that can't easily be duplicated with only one. 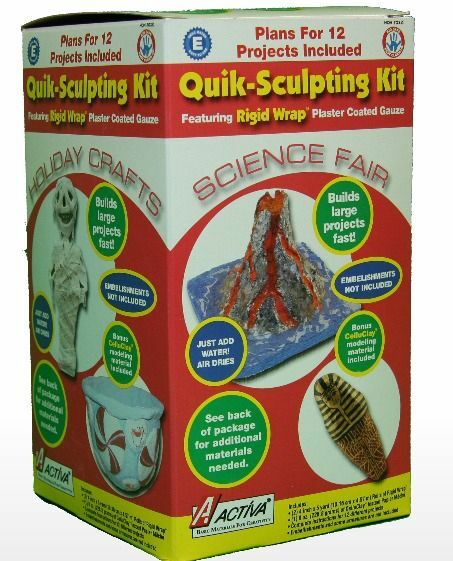 This kit would be a great thing to stock for a school year for things like science projects, holiday crafts, or some bonus fun in the summer!